"I think humans are a really confusing and complex species and most of our life is spent navigating how to exist with the minds we’re given." 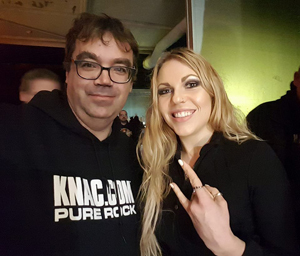 The Canadian hard rock / heavy metal quintet KOBRA AND THE LOTUS have been touring Europe a lot recently. 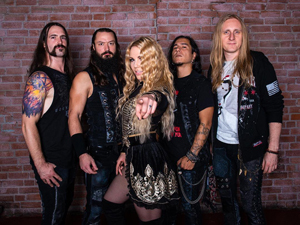 Having released their highly acclaimed album Prevail II in late April, Kobra Paige and her band returned to Europe co-headlining the Female Metal Voices Tour with BUTCHER BABIES, SKARLETT RIOT, IGNEA, and MAERTYRIUM in autumn. On 19 October, the five bands fronted by female singers played the Kubana Live Club in the medieval German town of Siegburg. The club itself is part of a larger complex accomodating a Cuban restaurant, a gymn and a sauna centre – enough opportunity for the bands to eat, work out and sweat – before sweating even more on stage. Unfortunately, for organizational reasons our interview with Kobra Paige scheduled before the show didn't happen that evening but we got in touch with the charismatic and powerful-voiced frontwoman of KATL via email after the tour to chat about the Femal Metal Voices 2018 Tour, the new album, inspiration and the struggles of femal artists in a predominantly male music industry. KNAC.COM: How was the tour? PAIGE: The tour was fantastic!! Awesome people, awesome and diverse bands, tons of comradery between everyone every day. KNAC.COM: Do you prefer playing in smaller clubs such as the Kubana in Siegburg on Friday or larger venues? And what did you think of the Kubana, which is not only a live club but also a restaurant, a gym and a sauna centre? Did you try the restaurant? PAIGE: I have to say a venue like Kubana is an absolute treat for touring artists. They took such great care of all of us. Most of us tried the sauna as well as the gym…..it was great!! What a beautiful sauna center. The food was definitely some of the best we had on the whole tour. If I could bring a facility like that all around the world on tour with us I would! About the venue size, I have to say I prefer more intimate settings in general. I enjoy sweating and being able to stand close to everyone’s face. KNAC.COM: You do a lot of touring on either side of the Atlantic. Last year, I saw you live opening for BRITISH LION in Cologne in August, then in December on tour with BEYOND THE BLACK in Cologne and now you're back in Siegburg. How are American and European, particularly German audiences different from North American ones? PAIGE: You know, here is the interesting thing...audiences vary within their own countries. Other than The Netherlands and Denmark, I’ve experienced this in most places. There are cities that are similar to each other in both American and European territories. Some audiences are loud and passionate while some are quieter and more observant. We experienced this extreme to extreme even in Germany on this tour. 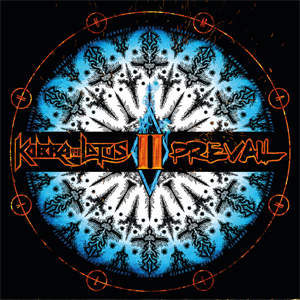 KNAC.COM: Let's talk about your last album, Prevail II, the 'sequel' to Prevail I. I felt that even though the two albums are definitely linked to each other, they are still quite different. Did you write the albums separately or did you write the entire material and then decide which song goes on which album? PAIGE: I think it’s a wonderful thing that you hear them as different. We strived very hard to achieve enough unity without making any songs sound too homogenous. All of the tracks were written at the same time and then the order/album was decided. KNAC.COM: How does the creative process work in KATL? What comes first, the music or the lyrics? PAIGE: Ooo, this can really vary depending on what sparks the first inspiration. This can be a riff, a sound, a vocal melody, the way a collaboration unfolds or a rewrite of a certain part….it changes from song to song. KNAC.COM: What inspires you musically and lyrically? PAIGE: My life and how I observe it. I need to speak my truth, what I see around me, the struggles and triumphs, and hugely, the impact we all have on each other. I think humans are a really confusing and complex species and most of our life is spent navigating how to exist with the minds we’re given. KNAC.COM: How personal are your lyrics, e.g. “You Don't Know”, “Let Me Love You”? PAIGE: They’re very personal and honest. I’ve found that the more vulnerable and clear I write, the more people relate with their own story. KNAC.COM: Live you play “You Don't Know” somewhat differently from the album version by adding a laid-back intro before the drums kick in. What's the idea behind this? PAIGE: I really wanted to set the tone live and make the audience re-focus. For me these elements are very important when performing songs in front of people. I want to shape the experience even further. KNAC.COM: Ronny Gutierrez joined KATL as a permanent guitarist in March this year. Before that, you had guest guitar players sharing guitar duties with Jasio Kulakowski. What made you recruit Ronny? PAIGE: Jasio has known Ronny for a couple years now. We’ve asked him to tour with us before but he wasn’t interested in session work. When we put the feeler out for a permanent member he put his hat in the ring and none of us wanted to look any further. He’s the guy we were waiting for all along, it just took a couple years for our paths to cross at the right place, right time. KNAC.COM: You have just played clubs in Europe on the 'Female Voices in Metal Tour 2018'. In an interview published in August 2017, ARCH ENEMY's Alissa White-Gluz says: “It's really not easy for women, actually. We face a lot of criticism, we face a lot of lose-lose situations. […] But I feel like now we got to the point where the definition of metal has become: 'Be yourself, be who you are. '” Do you, as a female artist, feel you have to struggle more and have to overcome more difficulties than your male colleagues? Do you agree with Alissa and is this really changing? PAIGE: I agree that it is certainly a more difficult and challenging disposition to be a woman within this alternative genre. I have faced some very absurd, unfair, and disrespectful scenarios many times on the road and within the industry in general. This past year has been a particularly challenging one. I almost felt like packing it in once and for all. I’ve felt kicked down and dragged through the mud by people that seem to walk over dead bodies without accountability but, honestly, it fuels more passion to persevere. As far as being yourself is concerned, that’s not something I’ve ever specifically associated with metal and I’m of a different mind. One should always strive for authenticity no matter the path they’re on. I’ve also found metal to sometimes be one of the “clickiest” genres to be a part of due to the strong opinions people have about defending what they think true metal is. It can be both very welcoming and very exclusive in a cruel way. My band has always had a rock and roll part of it and it gets completely trolled by metal purists when new songs are released. Being yourself has always been my motto in my life, perhaps that’s why we don’t always fit in for some of the metal community. KNAC.COM: What are your plans for after the tour? Will there be a chance to see you headlining a European tour soon? PAIGE: I’m not certain about what our next tour plans will be but I can reveal some very exciting news...we are going back into the studio these next several months with the full intention of receiving another new album next year. We’ll be doing this album in Orlando, Florida, the land of Disney World and I can only hope some of that magic will rub off on us!! Thanks very much for having us!